Tag Archives for " wonder wheel "
This is a Wonder wheel view of the search for small business marketing. What I like about this is that I think it gives a very simple map for optimizing your web pages, blog posts and entire site and a great starting place for building much more effective PPC campaigns. There are many more sophisticated ways to all both of these, but sometimes simple is better! 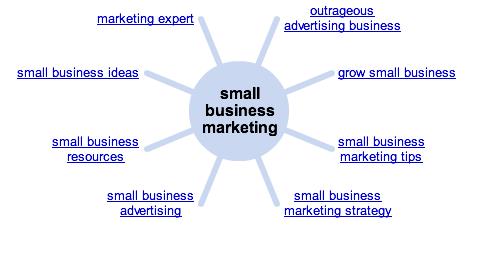 1) Optimizing your site around important and related keyword phrases. If you’re going to win the search battle for your most important search phrases you’ll need to think strategically about it. The more competitive the terms, the more you have to optimize very specifically. Using the Wonder wheel approach you could focus on the optimizing your home page for the core term and then building content pages specifically focused on each of the spokes in the wheel. This basic approach allows you to take huge cue from Google as to how they view your term. OK, there’s lots more to it, but this is the basic foundation. 2) Creating more effective PPC campaigns. The more targeted any ad is in both audience and message the more likely it’s going to perform. Using the Wonder wheel approach you might ditch the core phrase because it’s likely too expensive and crowded, but focus on building separate campaigns and ads for each of the spoke terms by creating numerous ad groups by Wonder wheeling those spoke terms for another good 5-6 phrases. You can then add Google’s keyword suggestions to finish off your groups with no more than 10-15 for each. Make sure you create specific ads for each group. Again, a very simplified approach to what can be done in far more complex ways, but this might be a great way for you to get started right. 3) Shaping your blog content. The Wonder wheel is a great tool to use along side your post writing. You can determine what you are going to write about and use the Wonder wheel suggestions on the spokes as phrases you might also want to work into a post. Or, you can use the Wonder wheel to suggest topics that you should be writing about and including as phases in your blog post titles. This approach might be one of the easiest ways to keep your mind buzzing about topics for posts while keeping your SEO efforts focused as well.